After over 24 hours of travel (I loose count after 24) I managed to check in and finally get some sleep. Today is my recovery day before I officially start tomorrow, when I’ll be working twelve hour days, seven days/week, up to 12 December. 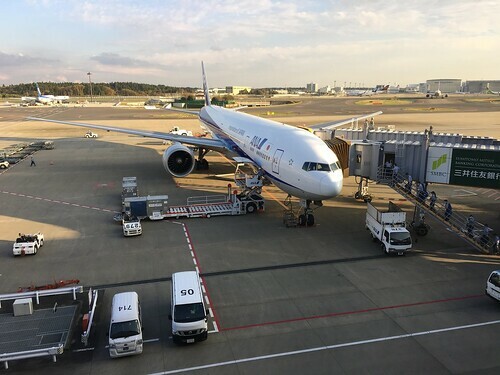 Then back to Tokyo for another business-based task. Just a reminder this isn’t a pleasure trip, but nevertheless quite interesting regardless. 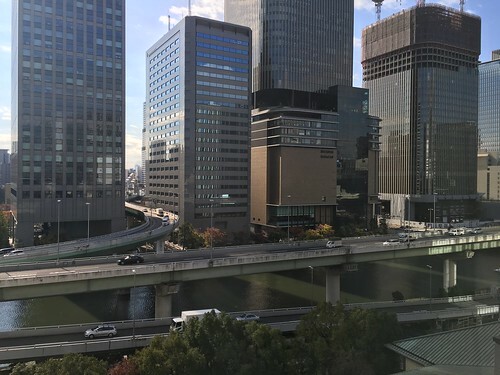 Still, the view outside the hotel window can be interesting and a reminder that Osaka’s environment is different from Orlando’s and Chicago’s, even Tokyo’s further east. The view is looking south across a tributary of the Yodo River (I keep wanting to type Yoda), and the Hanshin Expressway Route 1 Loop if you want to look on Google maps (I had to). I decided to do this in part to imitate John Scalzi, successful science fiction author and general raconteur, who while on The End of All Things book tour in August of this year photographed outside his bedroom window every morning because he was traveling between cities and book signings just about every day of the tour. The other part? Well, I have taken outside photos in the past, but just never called them out. I never knew they could be so… interesting. Once again the Apple iPhone 6s+ backside camera is called upon to take the snap. This time the iPhone’s embedded camera software made the decision to use built-in HDR to pick up detail and compress the visual information so that it could be seen on an electronic Retina display. And it is appreciated, let me tell you. When I can take a photo with one iDevice and see it essentially the same across my iPad Air 2 and my Retina MBP, then I consider that a powerful statement about the use of Apple technology for creative purposes. Back in Japan for another business trip. Took the “regular” flight out of Orlando on United/ANA through Chicago to Narita, Tokyo. My trip this December, which started November 29th Orlando time, is the most complex, involving two cities (Osaka and Tokyo) and requiring I use Japan’s train system more extensively than before. 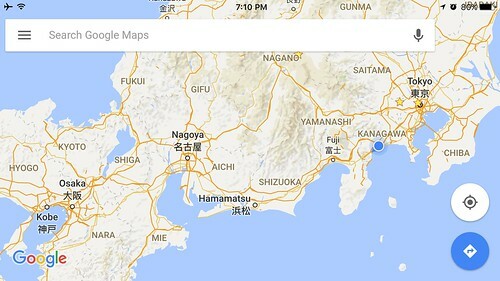 This screen capture of Google Maps shows the essential route from Tokyo to Osaka. I had to take two trains, the Narita Express from Narita to Shinagawa, and the Shinkasen Hikara from Shinagawa to Shin-Osaka, or Osaka. 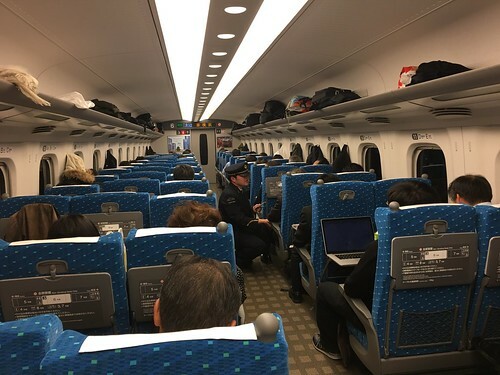 I would have gotten to the hotel about 45 minutes earlier than I did, but the Narita Express was so quiet and I was so tired I slept through the Shinagawa stop. I had to take a train back two stops, and there the very nice train personnel helped me to change my ticket to a slightly later train. 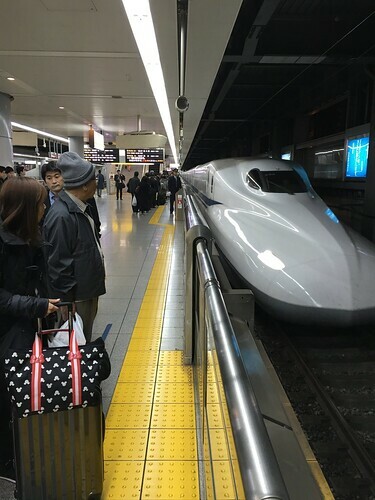 After two years of travel to Japan I’m still impressed by the quality of the Japanese rail system, now even more so after having ridden on the Shinkansen. Compared to flying on a contemporary Boeing 737 jet with a domestic US carrier, the interiors are spacious and comfortable with plenty of leg room, allowing me to lean back and nap. Both the Narita and the Shinkansen are smooth and quiet. One thing I did notice and that’s the apparent speed. While you’ll read the occasional story about high speed runs, the speeds through the heavily urbanized corridor I traveled were more “sedate.” But that’s not a problem when someone else is doing all the driving while you just sit back and relax. I’m doing something very different for me. Now that I’ve got an iPhone 6s Plus I’m using the back-side camera rather than pulling out my Olympus E-M10. And I’m very pleased with the results I’m getting. I fully understand now why so many prefer smartphone photography, especially on the iPhone. If I were forced to I’d leave all my interchangeable lens cameras at home and just use the iPhone. As it is I only have the E-M10 and a few, very compact lenses. I’m also using a WiFi hotspot rental I picked up at Narita. For about $10.50/day I have 4G LTE connectivity with unlimited data. My iPhone and MBP are wirelessly linked to it. This gives me the connectivity I need for a lot less money than if I were using AT&T in Japan. AT&T on travel is just too damned expensive.